14 A General Stoletov blvd. In 1974 the laboratory was created following the consolidation of existing laboratories "Measles" and "Mumps" and in 1978 the laboratory started to includes the problem "rubella". By 2000 laboratory "Measles, mumps, rubella" is developing in several areas: scientific, viral diagnostic, production and training. Also seroepidemiological studies on the immune status of the population and control the effectiveness of the measles, mumps and rubella vaccines in Bulgaria and improving the quality of Bulgarian vaccine preparations (measles and mumps) and associated (measles / mumps) vaccines and diagnostic agents which are used for serological tests. 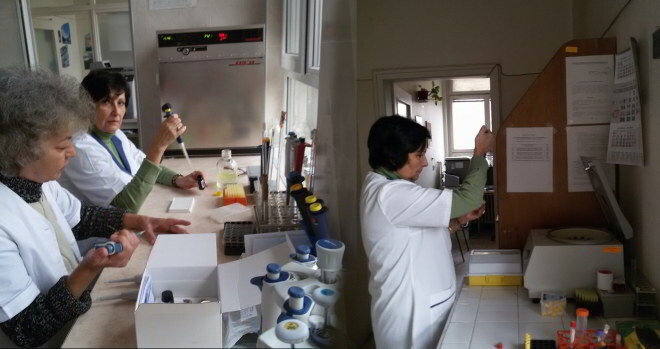 After 2000 the laboratory is primarily engaged in diagnostic (development of new serological and virological methods), developing scientific problems, education and training aimed at: postgraduate education of specialists from the healthcare network and student training and seroepidemiological studies on vaccine-preventable diseases - measles, mumps, and rubella. By order of the Ministry of 04/06/2001, the lab receives reference functions for the country and was renamed the NRL "Measles, mumps, rubella." Over the years, the laboratory has been headed by renowned experts in the field of virology, including Assoc. Prof. A. Mihailov to 2008 and Assoc. Prof. Dr. Z. Mihneva to 2014. • NRL evaluated twice a year the quality of diagnostic work of the virological laboratories in the country about detection of specific antibodies against measles, mumps and rubella. The diagnostic activity of NRL is related to the detection of basic markers of measles, mumps and rubella and is accredited by Standards BG EN ISO / IEC 17025. NRL "Measles, mumps, rubella" is part of the Global Laboratory Network WHO measles and rubella (The WHO Global Measles/Rubella Laboratory Network) and participates annually in several international programs for external control and quality assessment of diagnostic work (Institute INSTANT, Dusseldorf - Germany, European Reference Center WHO - Robert Koch Institute, Berlin, Germany and WHO Regional Measles Reference Laboratory -VIDRL, Melbourne, Australia. • Oral or buccal swab samples by wiping of the mucous membranes of the nasopharynx with Viral CULTURETTE® or sterile swab in a 2 ml sterile viral transport medium (VTM), storage at 4°C and transporting to 48 hours with coolers. А. Toshev. „Distribution of Erythroviruses in Bulgaria, serological, virological and molecular genetic studies”, Sofia, 2015.
ü Ivanova St., Mihneva Z, Toshev A, Kovaleva V, Andonova L, Muller C, Hubschen J. Insights into epidemiology of human parvovirus B19 and detection of an unusual genotype 2 variant, Bulgaria, 2004 to 2013. Euro Surveill. 2016, 21(4):pii=30116. ü Toshev A., St. Ivanova, L. Andonova, V. Kovaleva, Z. Mihneva. Detection of Human Parvovirus B19 (HPVB19) in serum samples from fever-rash ill individuals during the rubella outbreak (2005) in Bulgaria. Biotechnology & Biotechnological Equipment, Volume 28, Issue 6, 2014, pages 1103-1107.
ü Stefka Kr. Ivanova, Petia D. Genova-Kalou, Silvia Em. Voleva, Svetla G. Angelova, Borislav M. Marinov, Viktor Em. Manolov, Stoian Shishkov. Infectious Agents and Miscarriage in Bulgaria. American Scientific Research Journal for Engineering, Technology, and Sciences (ASRJETS) (2016) Volume 25, No 1, pp 1-10.
ü Ivanova St., A. Toshev, Z. Mihneva. Detection of erythrovirus B19 (EVB19) in patients with hematologic diseases (pilot study). Problems of Infectious and Parasitic Diseases, vol 42, Number 2/2014, 22-24.